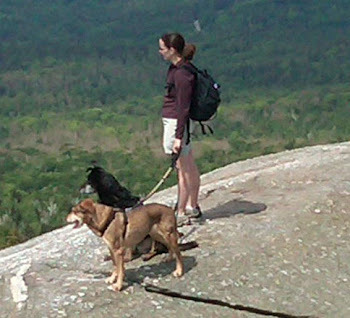 adoptable dogs for rescue groups, so no more hiking. Earlier this week, I posted a final farewell to my adventures here at Foster Dog Summit because it is now illegal to foster healthy, adoptable dogs for rescue groups in the State of New Hampshire. I asked anyone who wanted to know why this is now law to please send an email along with a photo of your dog to the state veterinarian with the following subject line - "Why is Fostering Healthy, Adoptable Dogs Now Illegal?" It is not illegal to foster an animal in New Hampshire, but there are certain criteria that need to be met. 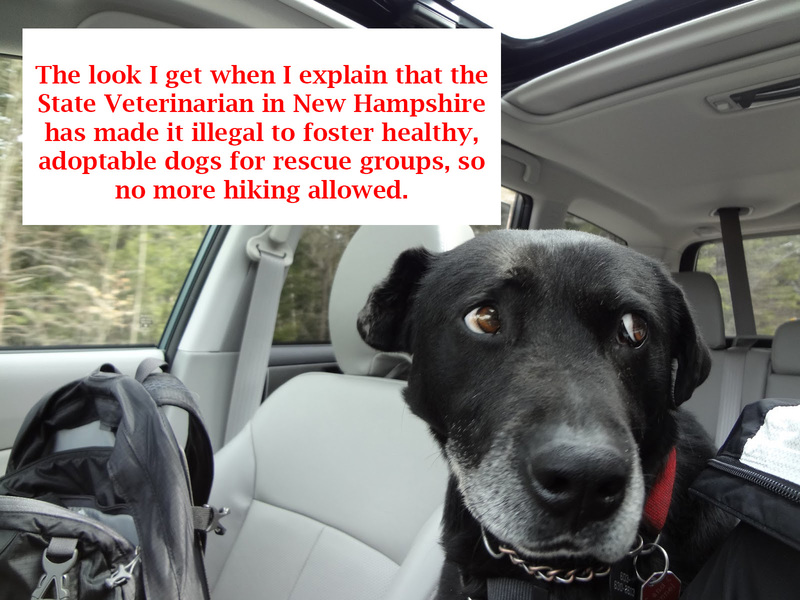 The title of blog, “Fostering Dogs for Rescues Illegal in New Hampshire”, is incorrect and misleading. Part of the recently passed rule is pertinent here (highlights added), “Foster facilities shall be used solely for medical or behavioral rehabilitation when a premises already holds a license to house animals. Foster facilities shall not be used as an extension of space for housing the general population of a licensee.” For many years, fosters have been considered an extension of a licensed premises. Note that the blog uses the terms “rescue” and “broker” nearly interchangeably. Brokers are not the same as rescues or shelters. By definition in statute, brokers arrange deals and/or transport animals. They do not have a licensed premises, thus brokers cannot use a foster unless it is a licensed location. We appreciate your concern and interest. While this is better than no response at all, I suppose, it still does not answer the question, "Why is Fostering Healthy, Adoptable Dogs Now Illegal?" Rather, it merely confirms what is accurately explained in my previous blog post. Essentially, if a dog is healthy, he or she must remain in a cage in a shelter until adopted or afflicted with an illness or a behavioral problem. It is now illegal for healthy, adoptable dogs, like the dozens of canine companions who hiked with me, to reside temporarily in foster homes. I am not using terms interchangeably or misleading anyone. I resent that accusation made by the state veterinarian, and I reiterate my repeated requests for him to substantiate the need for and quantify the risk of New Hampshire based rescue groups such as Canine Guardians for Life, Inc. being suddenly blindsided by an administrative rule change that has forced these volunteers to cease operations even though they have been licensed by the state and operating legally and effectively for several years. I used the defined term "Broker" accurately in referencing the license held by Canine Guardians for Life, Inc. and its compliance with all of the rules and regulations of the State of New Hampshire. If you would like to know why this legislation was changed or would like to share a story about the positive experiences that you have had volunteering with, adopting from or contributing time or money to a rescue group operating in New Hampshire that is negatively impacted by this rule change, it would be extremely beneficial for the State Veterinarian as well as your State Senators and State Representatives to hear about it as well. The foster dogs and I will miss seeing everyone on the trails. Thank you for your kindness and support over the years. Below is a video of the first two years of our adventures with Foster Dog Summit. as the state vet said "Brokers are not the same as rescues or shelters. By definition in statute, brokers arrange deals and/or transport animals. They do not have a licensed premises, thus brokers cannot use a foster unless it is a licensed location." Thus NO RESCUE GROUP should have a broker license. I see no reason why a rescue group would even consider going the broker license route. It make no sense at all. The ONLY reason I can even imagine would be to avoid an inspection of facilities, avoid more documentation or to avoid the quarantine. Rescues need to have the shelter/rescue license. It has honestly ALWAYS been this way. By that reasoning, nobody should adopt a dog from a shelter in New Hampshire. I disagree. I adopted two dogs directly from shelters. Again, there are plenty of shelterless rescue groups who were operating legally and only adopting out healthy dogs who are negatively impacted by this, and many dogs will die as a result. I have offered to take you to lunch Diane to discuss and provide you with accurate information.. I think if you have so much to say perhaps you should start your own blog. Your comments here are repeatedly inaccurate and not based on facts. Diane: Rescue's are given a Broker License to transport dogs within the State of New Hampshire. Shelter Licenses are also given to house rescued dogs in approved foster homes, which are also inspected by the State of New Hampshire. It is clear that you do not have the proper education regarding the licensing process in New Hampshire and your view of shelter/rescued dogs is biased. The state has pointed out to you that it's not illegal, yet you say it is. You are being a jackass. How can we get this changed to foster dogs in the state of NH?